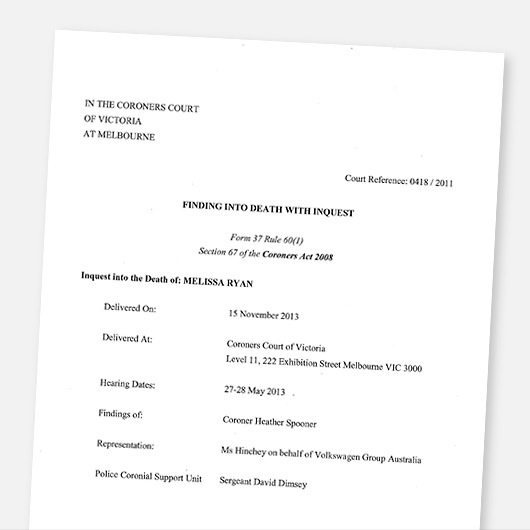 On Friday Victorian Coroner Heather Spooner delivered her findings into the investigation of the death of Melissa Ryan in 2011. The case came to prominence earlier this year after a concerted campaign from Fairfax Media. Fairfax Media reported on the incident with the headline “Death prompts VW owners to speak out”. Whether by intention or otherwise the article and subsequent intense coverage from Fairfax gave the impression that Ryan’s death was linked to ongoing issues with Volkswagen models, most fitted with 7-speed DQ200 DSG transmissions and 1.4 litre TFSI engines. 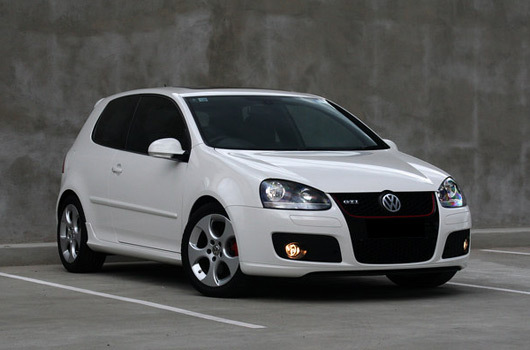 Ryan’s car was a 2008 Golf GTI fitted with a 6-speed manual transmission and a 2.0 litre turbo engine. Ryan’s family and Mr Mumford assert that a fault with Ryan’s car caused it to suddenly lose power leaving Mumford no time to avoid a collision. The coroner heard evidence from an independent auto electrician who had scanned the car for faults after the accident. He found that the car was in “limp mode” which would result in the car being limited to a speed of around 30–40km/h. Data captured from the wrecked car showed its last recorded speed was 31km/h. However, Volkswagen countered this evidence saying the auto electrician employed by the Ryan family used a generic OBD scanner which was not able to correctly read the time stamps assigned to each data recording. Volkswagen claimed the car only went into “limp mode” after the side airbag had deployed and that there were no pre-existing faults or mechanical issues with the car. Upon hearing the further evidence from Volkswagen the auto electrician engaged by the Ryan family conceded his original information was incorrect and agreed with the assertions made by Volkswagen. The inquest also found that Melissa Ryan had been on the phone for around 10 minutes immediately prior to the accident. Despite her car being fitted with Bluetooth functionality Ryan’s family agreed with the likelihood that the deceased was using her mobile phone on loudspeaker and that it was either placed on the centre console or on her lap. General evidence from Police given to the coroner said people using mobile phones while driving often results in inattention. In addition, in the context of a 100km/h road like the Monash Freeway where Ryan was killed, Police said drivers on mobile phones can sometimes be travelling as much as 60km/h slower than the regular flow of traffic without realising. Apart from the evidence of the truck driver, there was nothing to suggest that Melissa had suddenly stopped her vehicle; there was no fault detected in the diagnostic log and it may simply have been the speed at which the truck driver approached that made it appear as though Melissa had come to an incomprehensible stop when she had not. In regard to the impact of any mobile phone conversation it was the opinions of experienced operational police officers, Det Sgt Bellion and LSC Fraser, that driver can become engrossed in phone conversation to the extent that their ability to maintain travel speed is adversely affected, they slow down considerably, even on freeways. Det Sgt Bellion was of the opinion that this is what had occured in Melissa’s case and I agree that this is likely to have been a feature in the circumstances of this case. There are, however, some circumstances surrounding the death of Melissa, which even after the conduct of an inquest and consideration of all the evidence I am unable to reach a conclusion upon, to the required standard of proof. The overall impression of Det Sgt Bellion was persuasive in part, but I could not conclude with sufficient certainty that Melissa suddenly and inexplicably applied her brakes, nor that the truck driver approaching from behind altogether failed to notice that she was slowing and had not moved off with other traffic ahead. The coroner also stated that “drivers are encouraged to limit mobile phone use” due to the possibility they can become distracted. Volkswagen Australia’s official response to the inquest can be read below. Our sincere thoughts and sympathies remain with the Ryan family in what are tragic and very distressing circumstances. Volkswagen Group Australia has refrained from making detailed public statements on the Coronial Inquiry out of respect for the family and the Coronial process and will refrain from further comment. We thank the Coroner for the thoroughness of the inquiry and the manner in which it was conducted. Volkswagen Group Australia has fully cooperated with authorities and has actively assisted the Coroner in her investigations. Volkswagen Group Australia acknowledges the Coroner’s findings that the vehicle did not contribute to the cause of the accident. Volkswagen Group Australia repeated this position throughout the investigation despite a number of reports which tried to link the tragic accident with a completely unrelated recall matter. Volkswagen Group Australia would like to reiterate that there is no correlation between the Coronial inquest and the recent reports concerning the current transmission recalls. The vehicle at the centre of the Coronial Inquest had a manual transmission with no identified issues while the recalls only relate to certain Volkswagen vehicles with DSG transmissions. Customer safety and satisfaction are the highest priorities for Volkswagen Group Australia and have been so since Volkswagen began operations here more than 60 years ago. Since 1953, Volkswagen has sold more than 800,000 vehicles in Australia and has more than 300,000 vehicles on the road today and is one of the top ten selling brands in Australia.